Unbelievably, there are now only 3 months left in the Toastmasters year which is why we should now focus on ending the year strongly. Holding special meetings like a speakathon with 6 or 8 prepared speeches or a Table Topics Night. Documenting all the best practices and tips from this year to pass on to next year’s team. Making the most of District Initiatives, like the Pathways Progress Awards or the Club Ambassadors Programme. Awarding all members who achieved an educational award this year! What an interesting and varied month, demonstrating all that is most rewarding about my role in supporting the District’s success. The District Leadership Team (DLT) spent a productive day ensconced in a windowless meeting room to discuss progress and look at our priorities for the remaining quarter of the year. Thanks to all your great work the District is on course to be at least Distinguished this year, and hopefully Select Distinguished or better. You hopefully know by now that it is not the numbers that we celebrate, but the underlying factors such as more members in more quality clubs improving their own lives and those of others. 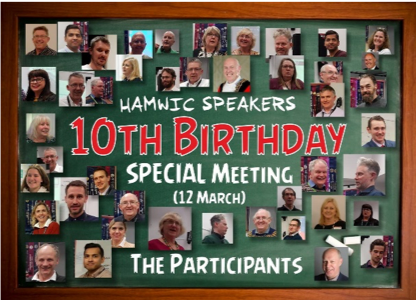 I was also delighted to be invited to Hamwic Speakers’ 10th birthday celebration. It was a brilliantly organised evening, with special guest the Mayor of Southampton. 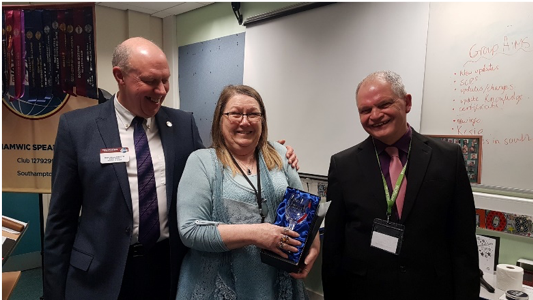 It was my honour to present a surprise award to Barbara Saph in recognition of her outstanding contribution to the cause of Toastmasters U.K. South. Hamwic Speakers also did something quite remarkable. To celebrate their 10th Anniversary, they took two people “off the street”, who experience anxiety with public speaking. Their challenge was to coach them over one month to then perform a two minute speech at the Anniversary meeting, which they did superbly! It was also my own club, Arun Speakers, 30th Anniversary of chartering this month – quite an achievement! We had I big celebration for our 25th, so this celebration was a little lower key, with a shorter meeting followed by a curry. 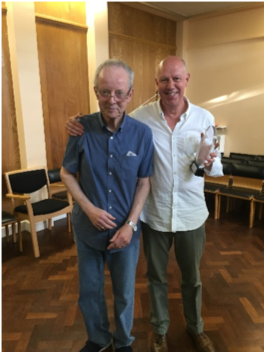 One of Arun’s Founder Members, Robin Chawner DTM, has been recognised by Fareham Borough Council for his contribution to the local community over many years, largely through his role in Toastmasters. 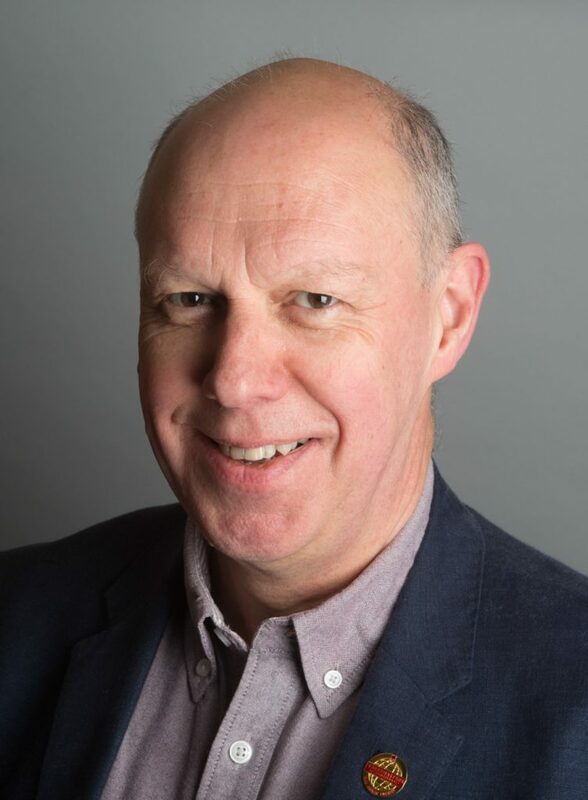 Robin has been awarded Citizen of Honour 2019 and is due to receive his award from the Mayor of Fareham. Sadly, Robin is not currently well enough to receive his award, and we wish him well. Robin has helped so many people over the years, and not only Toastmasters, and has been a huge influence on me. I am privileged to call him a friend. From one of our oldest clubs to one of our newest. I was invited to give the target speech for the first ever Evaluation Contest for Spirited Speakers in Forest Row, near East Grinstead. The club only chartered on 4th March and are incredibly enthusiastic. They had to cap the contestants at four for the International Speech and five for the Evaluation contest. I have been a member for over 18 years and these five new members gave me some excellent feedback and recommendations. A great demonstration that you don’t have to be more experienced than the speaker to be able to evaluate well! My focus now turns to the rapidly approaching District Conference in Ashford. In addition to terrific workshops, keynote speakers and District Contest finals, there is the small matter of the District Council meeting on Saturday morning. Further details of the programme, and how to book your tickets, can be found hereI look forward to meeting you in Ashford! I am impressed with the way our Club Officer Training went over the past few weeks, inspired even. Feedback on the recent District initiative to standardise content into a series of high-quality training modules has been excellent so far. These modules also led to further creative efforts, such as offering differing approach to problem solving when the module was presented twice at the recent London Leadership Institute. Together, we, you are truly raising the flag of excellence all over District 91! In just a few weeks, nearly 20 people have already signed-up as Club Ambassadors. Over a dozen clubs have already Talked-Up Toastmasters and recruited over five members. Finally, countless Pathways awards have been submitted and completed. Excellence is the fuel that makes us grow forward together! It is the Levels that marks a member conquering his or her nerves to become a confident speaker. It is the buzz that makes guests go “Wow! I want to join this group”. It is most importantly the helping hand that mentors us into better speakers and leaders. 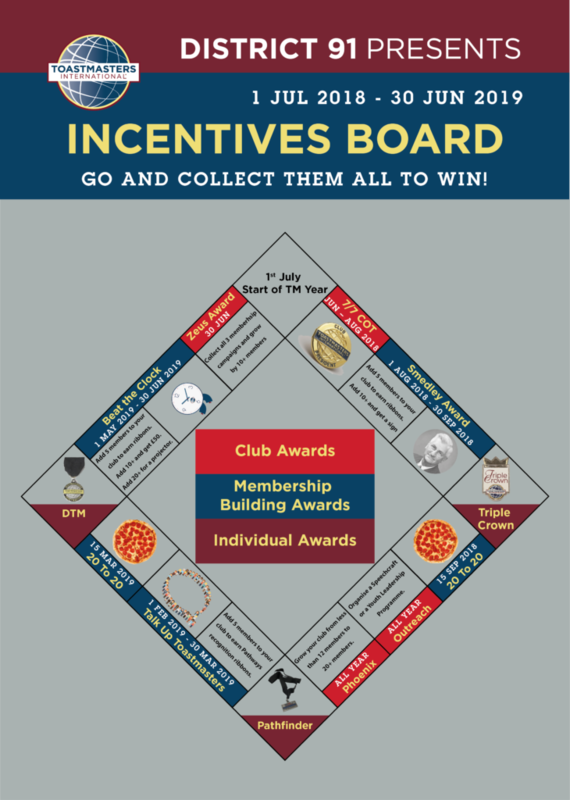 Oh, and don’t forget to have a look at our newly created incentives board. Posted on 16th March 2019 by Seema Menon in District Leadership 2018-19, Updates & Posts | Comments Off on Arnaud Sartre: Talk Up! 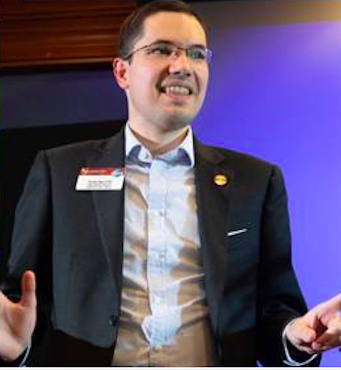 Let’s celebrate our 7th and newest Club so far this Toastmasters year, welcome Godalming Speakers to our District! A fine job executed by Tania, Marlane, Nikos, Janet and many more to bring this Club to our District, thank you! We have more news with 2 other Clubs expected to join our ranks in the next few days. In March, it is time to re-double our efforts when it comes to renewals, you wouldn’t want to miss out on the amazing Toastmasters programme, would you? Please talk to your VP Membership on how best to renew your membership and I look forward to your continued growth over the coming period. And let’s remember access to Base Camp will cease on 1st April unless a membership is renewed. It is also a fantastic time to bring a guest along to your next Club Meeting, imagine the difference you can make to somebody’s life, imagine being able to master that talk at work, that best man speech or that conference presentation. You can help someone achieve all this and more and while doing this, help your Club win the Talk Up Toastmasters Award! 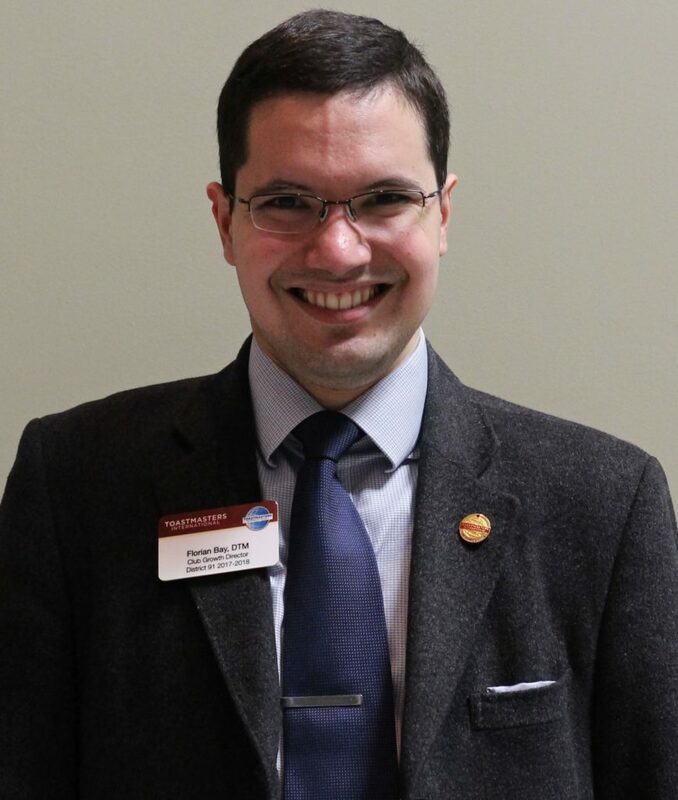 February was a particularly busy month for the extended District team with Area Directors and Division Directors leading numerous Club Officer Training (COT) and Toastmasters Leadership Institute (TLI) events across the District. A huge amount of time and energy goes into these events to offer leadership development opportunities to our Club Officers and all Members. Thank you to everyone involved. The mid-year finances have also taken up quite a bit of my time this past month. Not the most enjoyable part of my role because of ongoing problems with information from HQ, but nonetheless a very important area to ensure that we have the resources needed to continue to support our members. I can only be District Director because I am a club member, and I try to stay grounded in that experience. I am proud to be continuing my Toastmasters journey, and to be the first member of my club to complete Level 1 in Pathways. I challenge each of you to be the Pathways pioneer in your club. With only a third of the year remaining, we will inevitably be even more focussed on the District Goals, and Club Officers will be striving to achieve the Distinguished Club Program goals. It may at times seem that we are obsessed with the numbers. Always remember that while the numbers matter, and we all want to achieve the highest level of Distinguished that we can, what really matters is what those numbers represent in terms of making a difference to more peoples’ lives – one speech at a time.